These Chippendale chairs are solid and well made . Best purchase in furniture recently!!! 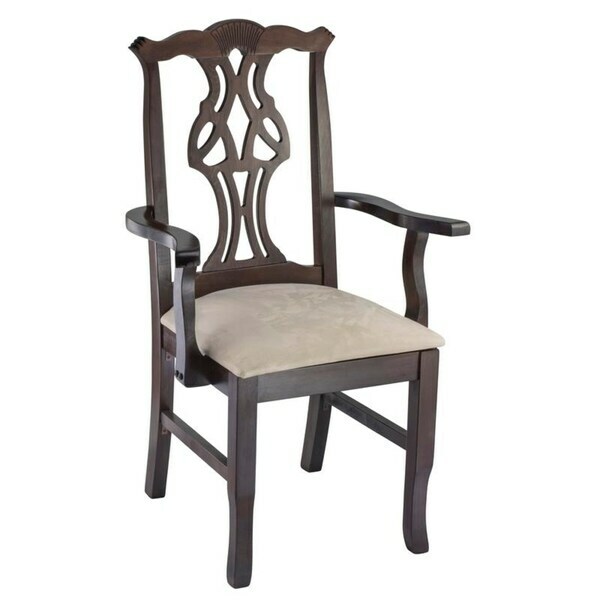 This traditional Chippendale dining arm chair adds timeless elegance to any existing dining room decor. This gorgeous upholstered arm chair showcases elegance and easy to maintain solid beechwood construction that is available in your choice of three finishes to more closely match your specific home decorating needs. The simple yet beautiful cream upholstery color accents the delightful carved lines of the chair back. Recommended Purchase - beautiful chairs! Ordered 2 arm chairs and six side chairs in Mahogony. Colors among the chairs and their fabric matched perfectly, solidly constructed, firm cushions - A+ purchase. Phenomenal chairs for the price with high end traditional styling. Very happy with my purchase!! 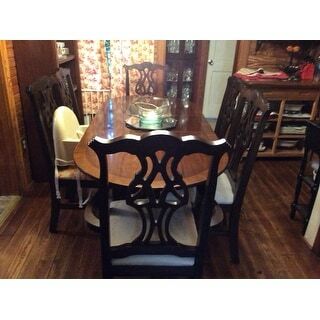 Purchased 2 arm chairs and 4 side chairs. The construction is great and I have small children who spill a lot so I love that the super suede cushions are easy to wipe clean. They just look beautiful with my antique dining table. Very comfortable and sturdy. It comes put together so no assembly required. Got two of these chairs. They compliment beautifully an antique mahogany dining table that has been in the family for ages. They are well-crafted and beautiful. Definitely for smaller persons. With the arms, the seat is very narrow. Bought 2 of these for the head of the table. They match well with my other chairs and the table. Arrived quickly and goes well with existing side chairs. Sturdy and well made. However, the chair back is very straight, not a bad thing, but by leaning a few extra degrees backwards, they could be a lot more comfortable to sit in. Possibly a bit narrow for larger people. Overall pleased with purchase. Arrived quickly and goes well with existing side chairs. Sturdy and well made. Overall pleased with purchase. "Is this for 1 or 2 chairs"
"What is the height of the arm? The chair has to fit under the table to be practical for use." "What is the height of the seat top? What is the height of the arm?" The seat height is 18''. Needed the arm chair to go with the 4 chairs. I hope they will match the antique dining set we inherited. "Does Overstock carry the matching side chairs for this armchair? If so, what are they (name/item#)? Thanks!" Hello amsNY, you can refer to item number 13333337 for a matching side chair. Thanks for shopping with us!